WINNETKA – The opening of Fred’s Garage in Winnetka is a sign that the village’s restaurant scene is on the upswing. While neighboring Wilmette has seen a plethora of new dining options open in its downtown, Winnetka has been lagging behind. But a mere two weeks in and Fred’s Garage is hopping, with waves of diners coming in to check out what the owners of the popular restaurant Ten Mile House in Evanston have done to the old service station. “We like being neighborhood friendly and accessible, but at the same time we provide a unique upscale, urban kind of environment,” Joe Krouse, who owns Fred’s with business partners Fred Gale and Robert LaPata, told DailyNorthShore. In addition to the original Fred’s Winnetka Service Station sign hanging in the entry, elements throughout the restaurant play homage to a 1950s gas station theme. 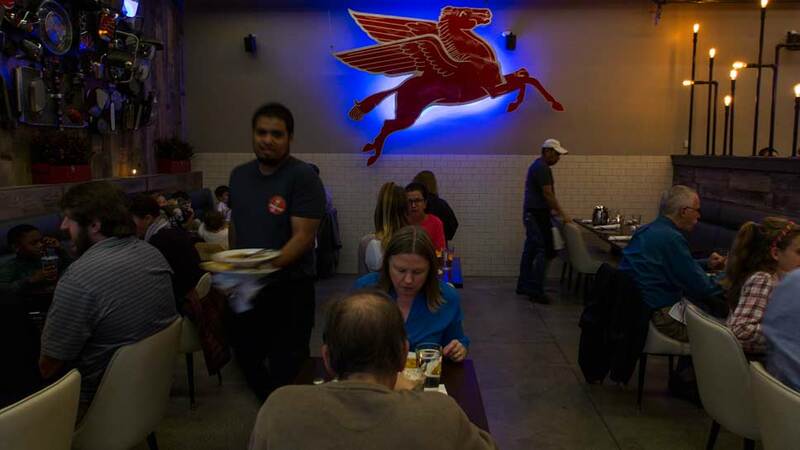 The famous red Mobil pegasus hangs front and center in the dining room, and an eclectic menagerie of mechanical spare parts hangs on an adjoining wall. 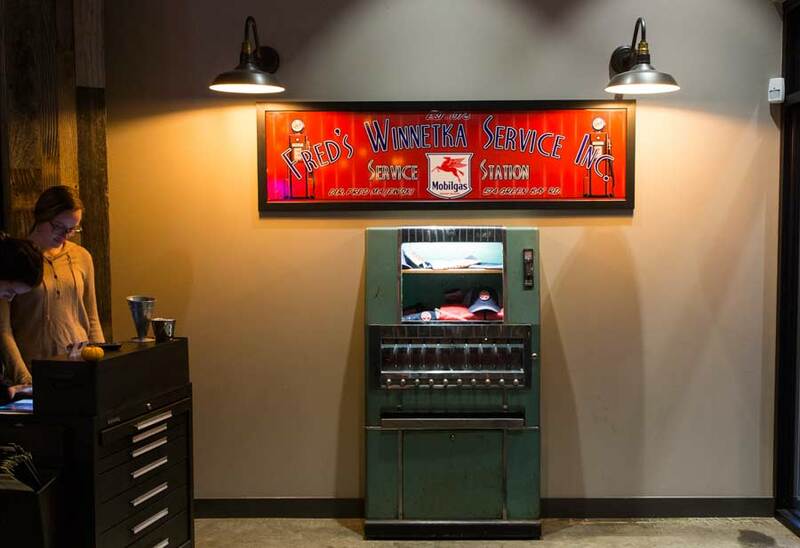 The waitstaff wears mechanics shirts with Fred’s Garage logos, and customers can also purchase their own T-shirts and hats from a vintage cigarette machine. 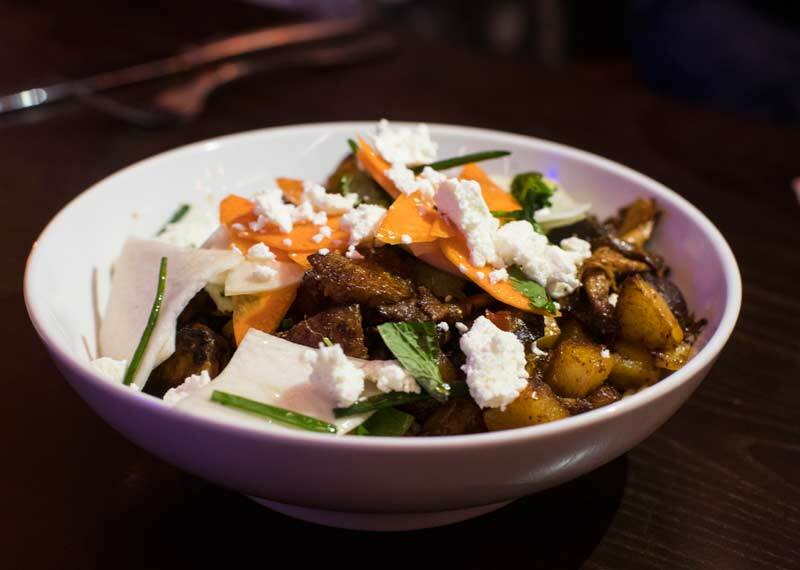 The menu is described as “elevated American classics,” using only the freshest ingredients. Executive Chef Michael Luth has more than 17 years of experience; he previously worked at Dusek’s in Chicago, which shares the same owners as Union Pizza in Evanston. “He is an experienced chef that is able to bring a unique twist,” Krouse said. While the menu has a range of options, from a vegetarian vindaloo dish or grilled salmon to fried chicken, the dishes that really shine are classic American comfort food. The flaming cheese curds are sinfully good, coated in a house-made cheddar and cayenne seasoning. Think elevated Cheetos. 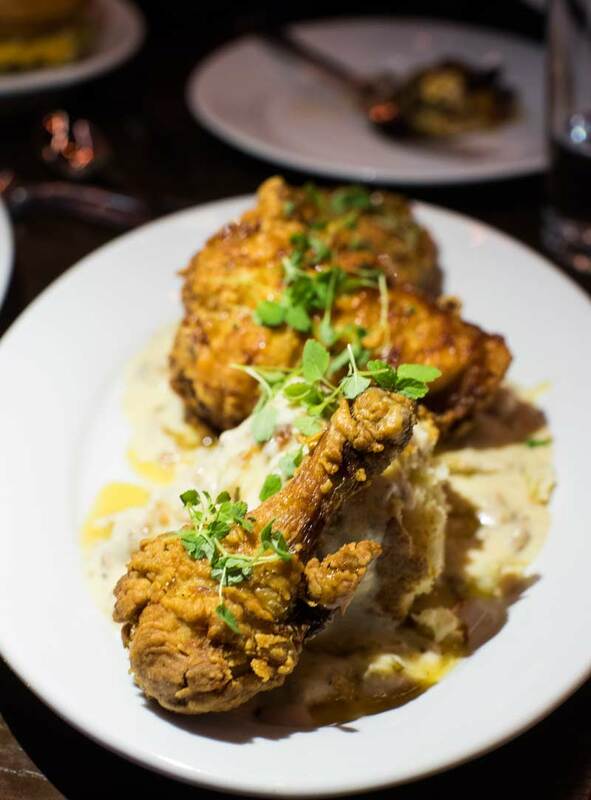 The fried chicken, served with a buttermilk biscuit and chorizo gravy, is mildly sweet from a drizzling of honey. The hamburger does not disappoint — two perfectly cooked thin burgers — on a soft brioche bun. 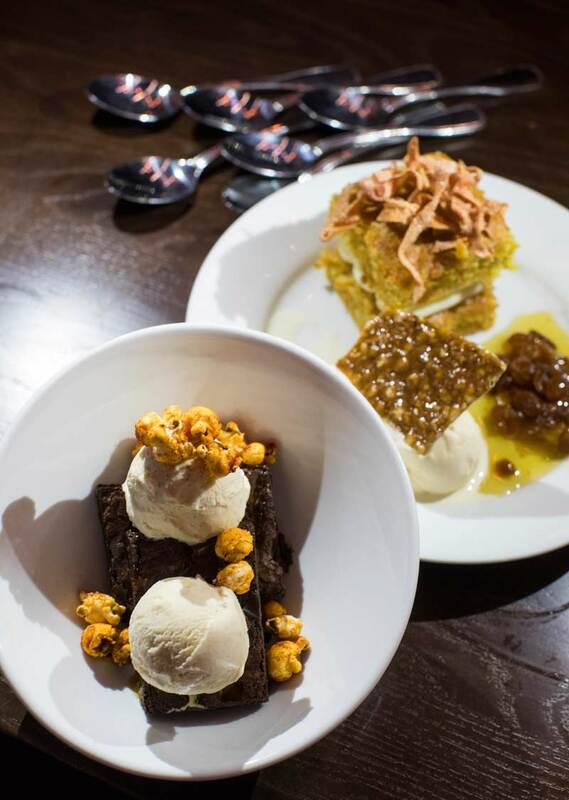 Diners with room can round out the meal with a choice of desserts, each accompanied by a scoop of Homer’s ice-cream. The carrot cake is particularly delicious, topped with candied carrots and a scoop of ginger ice-cream. Chocolate lovers will enjoy an indulgent brownie-a-la-mode, topped with a spicy popcorn that creates a nice, salty contrast. Fred’s Garage also offers an assortment of craft beer, specialty cocktails and wine by the bottle or glass. A u-shaped bar sits adjacent to the dining area, surrounded by comfortable bucket stools. While Krouse described Fred’s Garage as a restaurant with a bar, the bar area is spacious, with plenty of flat-screen televisions to take in a game. For those looking to stay out past the kids’ bedtime, the restaurant is open until 11 p.m. Monday through Thursday and until midnight on Friday and Saturday. Fred’s Garage is only serving dinner for now but will in the future serve lunch daily and brunch on the weekends. Eventually, food will also be served on the spacious patio, which features lounge furniture, fire pits and games to enjoy. Large garage doors facing the patio can also be opened in the nicer weather, making Fred’s Garage a standout option on warmer days. Fred’s Garage appears to be a popular spot for all ages, with young families arriving early for dinner, and couples and families with teens coming as the night goes on. Appealing to everyone was the intention. 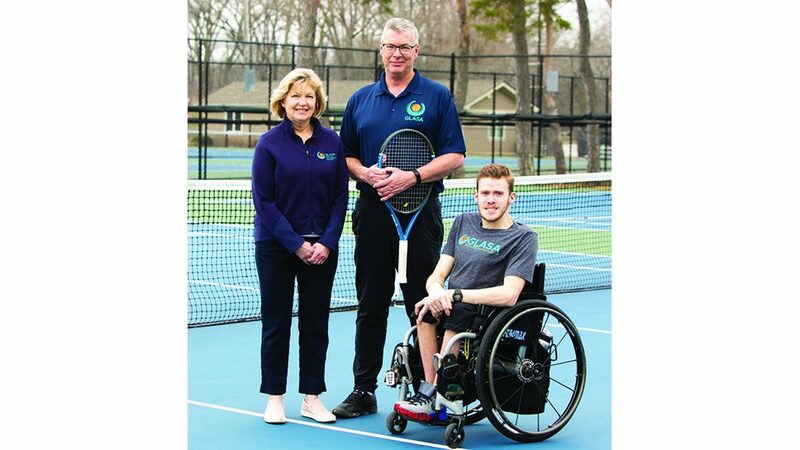 “By having an approachable and social gathering spot we are open to multi-generations,” Krouse said. Fred’s Garage is located at 574 Green Bay Road, Winnetka. It is open for dinner Monday through Thursday 4:30 p.m. to 11 p.m., Friday and Saturday 4:30 p.m. to midnight, and Sunday 4:30 p.m. to 9 p.m. For more information, visit www.fredswinnetka.com. The newly opened Fred’s Garage in Winnetka includes familiar signage. The Fried Chicken and Biscuits, with Half Chicken, Chorizo Gravy, Burn Honey Drizzle, Buttermilk Biscuit. The Garage Salad, with Capicola, Crispy Salami Croutons, Kalamata Olives,Cherry Tomatoes, Shaved Onion, Pickled Banana Peppers, Haricot Vert, Parmesan and Havarti with Herb Vinaigrette. 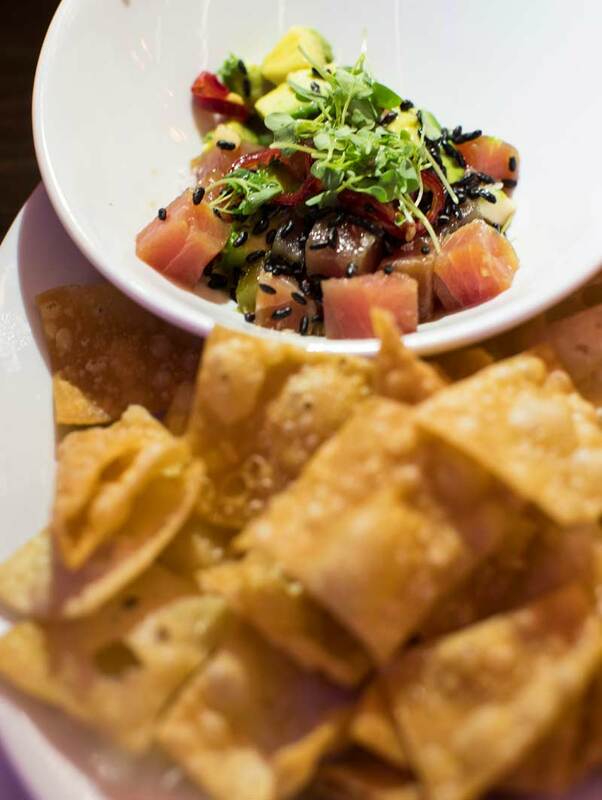 The Hokey Poke, Tuna, Sweet Soy, Radishes, Compressed Cucumber, Avocado, Pickled Fresno Chiles, Chives, Puffed Forbidden Rice and Wontons. Fred’s Garage is located at 574 Green Bay Road, Winnetka. It is open for dinner Monday through Thursday 4:30 p.m. to 11:00 p.m., Friday and Saturday 4:30 p.m. to midnight, and Sunday 4:30 p.m. to 9:00 p.m. For more information go to www.fredswinnetka.com.